Gwydir Castle is situated in the beautiful Conwy Valley and is set within a Grade 1 listed, 10-acre garden. Built by the illustrious Wynn family c1500, Gwydir is a fine example of a Tudor courtyard house, incorporating re-used medieval material from the dissolved Abbey of Maenan. Further additions date from c1600 and c1826. The important 1640s panelled Dining Room has now been reinstated, following its repatriation from the New York Metropolitan Museum. This location is based on the Post Code provided and is an approximate representation of the providers actual location, not recommended for detailed route planning. Location Map, use the "+" and "-" to zoom in and out. 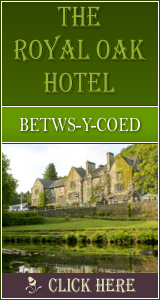 We believe a listing on Beautiful North Wales to be one of the most effective methods of promoting your North Wales Accommodation - Hotels, B&B, Guest House, Camping and Caravanning, Self Catering, Holiday Cottages or Farm Short Break. To demonstrate this you can see from the following indicative calculation how much the traffic generated is worth when compared to other Internet advertising methods. Visitors to Beautiful North Wales are ready to make decisions on accommodation and are therefore of an extremely high quality. 1327 Click Throughs => �663.5 Since 13/May/2013 based on an example �0.50 cost of a click through from Google pay per click. The click through ratio to this accommodation provider's own website Since 13/May/2013 is 21% . To get your website listed today, call us now.